Manicotti is the only pasta I deem worthy of ordering at a restaurant. Maybe it’s just me, but I have a really hard time paying $20 for a plate of spaghetti that I know I could easily make at home for a fraction of the cost. Manicotti is exempt from that rule because it feels special and more complicated. I was always a bit intimidated by it but temptation motivated me. There is a little Italian place in the city that is sentimental to me for a variety of reasons. My Main Taste Tester and I went on one of our very first dates there, and my younger sister and her boyfriend love it and ask to go every time they come into town. The place has lots of good memories for me. And the food? Incredible. My favorite order is the Chicken Manicotti with Rose Sauce. I always pretend that something else might be a contender, but that’s been my order every single time I’ve gone. I challenged myself to make my own at home and on a whim, made this version. I have to say, I am thrilled with how it turned out. It’s definitely a bit of work but certainly not as daunting as I thought it would be. It makes a lot which is awesome for a dinner party but you can easily freeze half, as I did, for a fancy impromptu meal down the road. Romantic Valentine’s Day supper? Done. I just have to pull this baby out of the freezer. Put a large pot of salted water on to boil. Once boiling, add manicotti and cook according the package directions. Once cooked al dente, rinse in cold water and set aside. In a large skillet on medium heat, add olive oil, onion and garlic. Sautee until fragrant. Add chopped cream cheese and stir until melted. Add seasoning salt, basil, oregano and milk. Stir until smooth. Stir in parmesan and spinach. Once cheese is melted and spinach is wilted, stir in chicken. Pour in a bowl and set aside. In the same large skillet, add all sauce ingredients and stir until smooth and well mixed and cream cheese has melted. Add more milk if you wish depending on how thin you want the sauce. 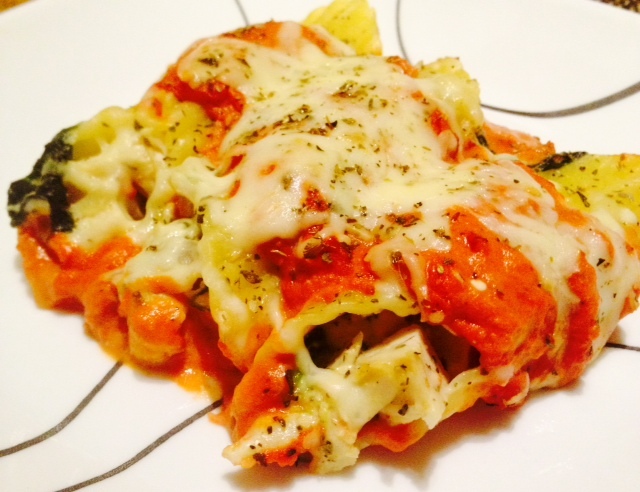 To assemble manicotti, spread half the sauce in the bottom of a 9×13 dish. Fill each noodle with the chicken filling (I used a teaspoon) and lay in the dish. Repeat until all manicotti are filled. Pour remaining sauce over the entire dish. Top with shredded cheese and parsley. Bake for 30 minutes or so until noodles are tender and cheese is melted.